Perhaps the most immediately important international access to Killarney is via Cork Airport, which is only 70 minutes drive from Killarney and provides a range of UK and EU connections. It has 5 daily flights to London alone, which provides access to all major world airports. Shannon Airport is approximately 100 minutes drive from Killarney and in addition to UK and EU connections it offers direct flights to the USA with pre-clearance facilities for US bound travellers. 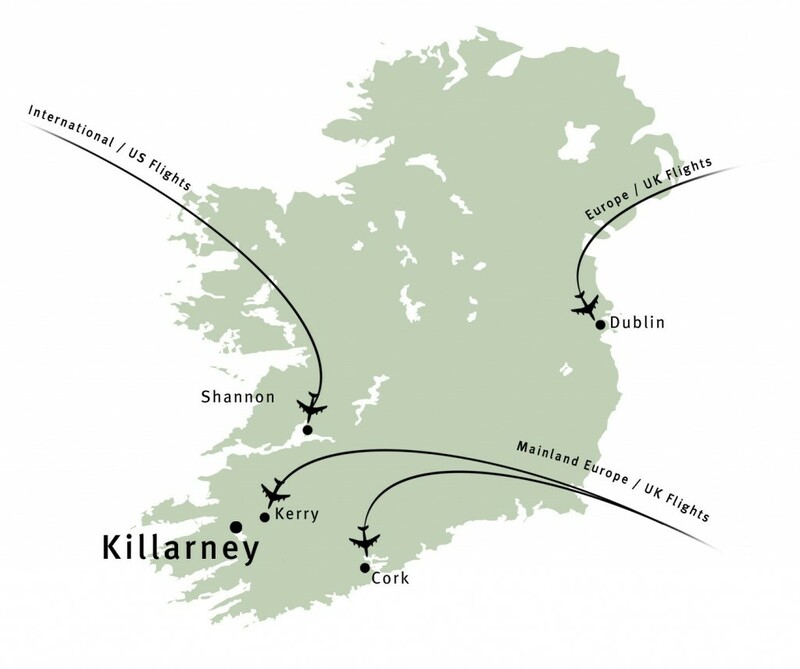 Kerry Airport is located only 15 minutes drive from Killarney town. Kerry Airport provides Killarney with direct daily access to the UK and Germany with developing routes other EU & UK destinations. It provides multiple daily commuter connections to Dublin International Airport and onwards to the wider world. Dublin Airport provides significant international access to Killarney via Kerry Airport but also through its connections with Cork and Shannon Airports and of course also by linking to Killarney by road (3.5 hours), and by rail from Dublin City direct to Killarney in 3 hours. Irish Rail, the national rail company, provides daily train services to and from Dublin, Cork, Limerick and Galway. The National Bus Service, Bus Éireann, provides daily bus services to and from Dublin, Cork, Limerick and Galway and within Kerry to and from all of the main centres of population. An improved road and rail network and infrastructure to Killarney reduces transfer times significantly – including new motorway Dublin to Cork and new bypass tunnel in Limerick.